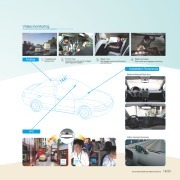 Driver Status Monitor (DSM) is a kind of driving auxiliary warning system that is based on machine vision technology to detect driver abnormal driving status. It can help detect and alarm the following conditions, including fatigue, distraction, smoking and making a phone while driving. Advanced Driver Assistance System (ADAS) is used to detect complex situations in front of the car and provide early warning, such as lane departure warning and collision warning in real time to reduce the driving risks. Driver Warning Display: R-Watch can be installed inside the car to provide the driver with real-time aided driving information display, combined with sound alerts and warnings.